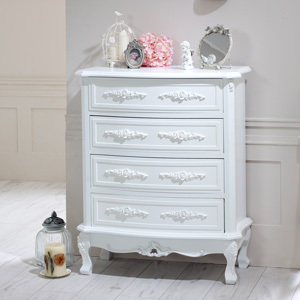 Stunningly beautiful white painted bedroom furniture, the Rose Range is perfectly designed with rose floral carved ornate detailing. The ranges most beautiful feature has to be it’s carved rose handles on drawers and cupboards giving it a shabby chic, french feel. The range consists of antique French style double wardrobe, bedside tables, full dressing table set and large chest of drawers, all mostly or fully assembled wooden furniture. In a beautiful satin wood painted finish. One of most popular ranges, the rose range collection is timeless and elegant, allowing you to achieve the most perfect French boudoir feel. Simply choose one piece to stand alone as a statement or create your dream shabby chic haven with full bedroom furniture set.